Because it's a desktop RSS reader, it's much faster than reading Bloglines on the web. It syncs with Bloglines, and marks the online entries as read. GreatNews is to Bloglines as Outlook is to Yahoo!Mail. 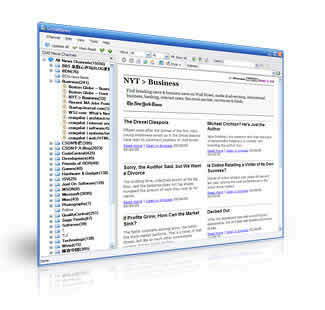 If you're at a different computer, you can still read Bloglines on the web. But GreatNews installs and runs on a USB drive, so you can take it with you. If you've set up iRider as your default browser, then clicking an entry in GreatNews will open it in iRider. I had got a desire to start my own firm, however I did not earn enough of money to do it. Thank goodness my colleague proposed to use the loan. Thence I received the credit loan and realized my desire. Art calls for complete mastery of techniques, developed by reflection within the soul. Do you agree? I messed around with Great News and Bloglines early on, and it was super buggy for me. Now perhaps its improved since then, but now I'mn pretty much locked into Google Reader. And of course, they now have an offline mode too... so the world is my oyster. Nice. It ALMOST made me switch from SharpReader; the only thing is, unlike SharpReader, I cannot force a site to display the whole page (useful for sites like Charlie's and Hot Air).